Last winter, my grandmother knitted a sweater for me. Since then, she's made garments for my mother, my father, my aunt, a niece and a nephew. And then I'm probably skipping a few projects of hers... She really enjoys her knitting and especially if one of her relatives will enjoy the result. Although my brother and sister are still without granny-made clothes, I'm all set to get another one. 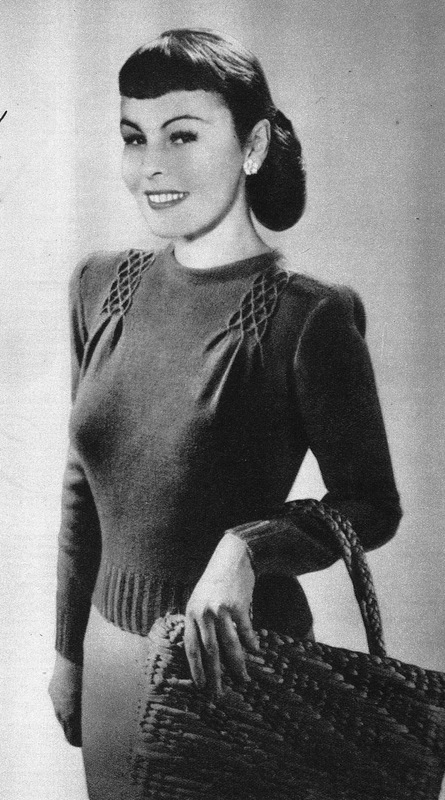 This lovely sweater was published in Dutch women's magazine Margriet in the autumn of 1950. It is sort of in my size (and described as being for 'the eldest daughter. They mean to say it's for a teenager, but hey, I'm the eldest daughter of gran's eldest daughter...). At first, my mom was going to knit it for me but since she's only knitting to fill the time until she can go back to doing all the other things she likes better, she has passed it on to her mom. I hope she'll like it. Like nearly all 1950's knitting patterns, this one asks for rather thin yarn. 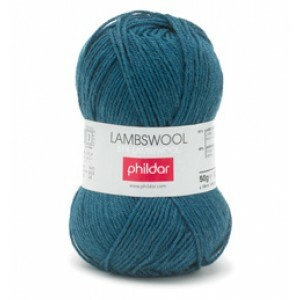 So thin, in fact, that most yarns avaible in the desired thickness are intended either for baby clothing or for socks. I picked this one, which is ever so slightly thicker but gran said that shouldn't be a problem. At least in this stuff, I could get a really nice colour. I think it's so sweet she wants to knit this for me, and I'm so curious to see how it turns out! The first one is, quite simply, that two days of Modefabriek left me rather tired and with painful feet (you just can't not wear heels at a fashion trade show...). And because I'd been so busy helping to finish M's collection in the week before, there was the inevitable backlash in housework (E is just swamped in work lately, so he couldn't do much either). 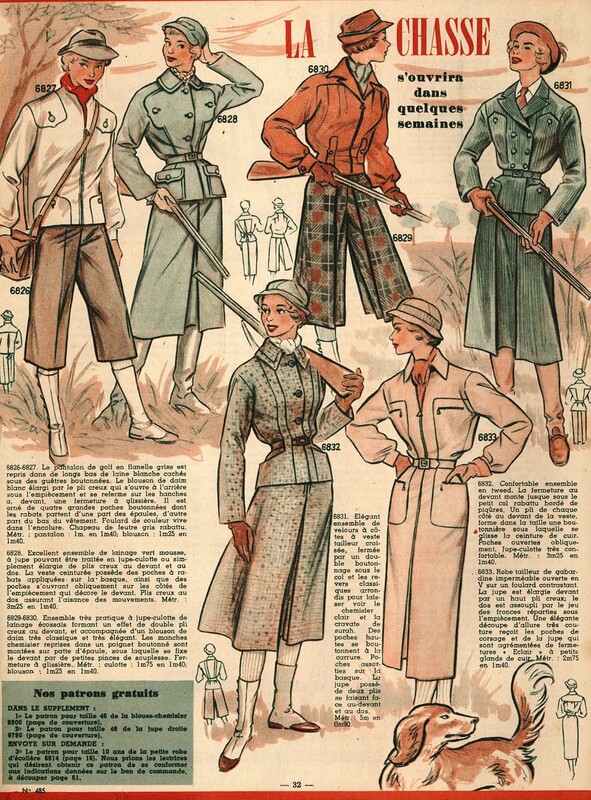 The really good reason however, has nothing whatsoever to do with fashion or sewing. It's that my mom had her second operation last week. The one remaining metal hip implant was removed and replaced by a non-metal one. We were all expecting her to have to go to a care home after leaving the hospital, like before. However, she did so well after the surgery and she's so good at feeling what she can and cannot do, they let her go home. My dad is taking care of her and she's doing really well, but of course, I had to pay a visit and help them a bit. Those were my excuses, now let me get on with the good stuff. Yesterday, I didn't feel like doing any of the chores on my to-do list. Instead, I decided to make a dress for the newly arrived hot weather. I tried to take very summer-y pictures with my big straw hat on, but small 'picture corners' and big hats don't go together, so I took it off. I've had this fabric in my stash for two years and it was always intended for a summer dress. It's fairly thin blue cotton with large embroidered (with thread in the same colour) flowers with eyelets in a 40 cm wide band along one selvage. When I bought it, I envisioned a maxi-dress but I could never get excited enough about that idea to actually make it. So now, I did what I often do when trying to figure out what to make from a certain piece of fabric: I played around with it in front of my bedroom mirror. Lazy mornings are great for this (especially those rare random ones on week days, when there's no one else in the house). Just take ages to get dressed and 'analyze' several lengths of fabric in the process. With a fabric with an obvious border, like this one, a gathered skirt is the obvious choice. I also knew I wanted a bodice without sleeves but not strapless. Knowing the 'regular' halter styles don't work for me (those are designed to flatter a larger bust) I tried out several things on the same sketch, before returning to the mirror and deciding on this very simple style. Then, I started on the pattern. 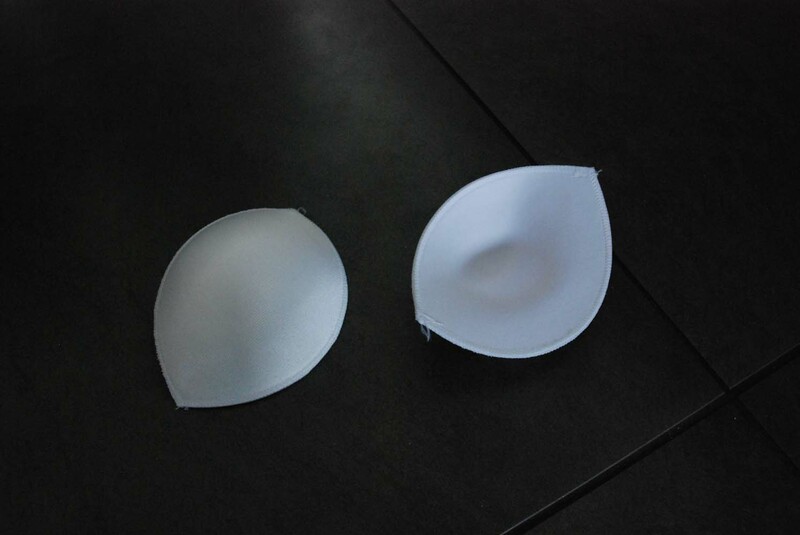 I combined my basic strapless bodice with my usual bodice sloper to draft the front pattern piece. The long ties are cut on. For the side back, I used the pieces of the strapless bodice, making the top edge of the piece lower towards center back. For the center back piece, I did something new. 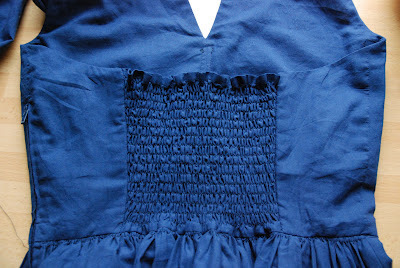 Now, I thought it might be just the right thing to create a bodice which would fit snugly but still be comfortable. As it turns out, I guess I should have made it a bit tighter although I'm OK with it for now. I'm wearing it with my red elastic belt which I think provides a nice contrast. 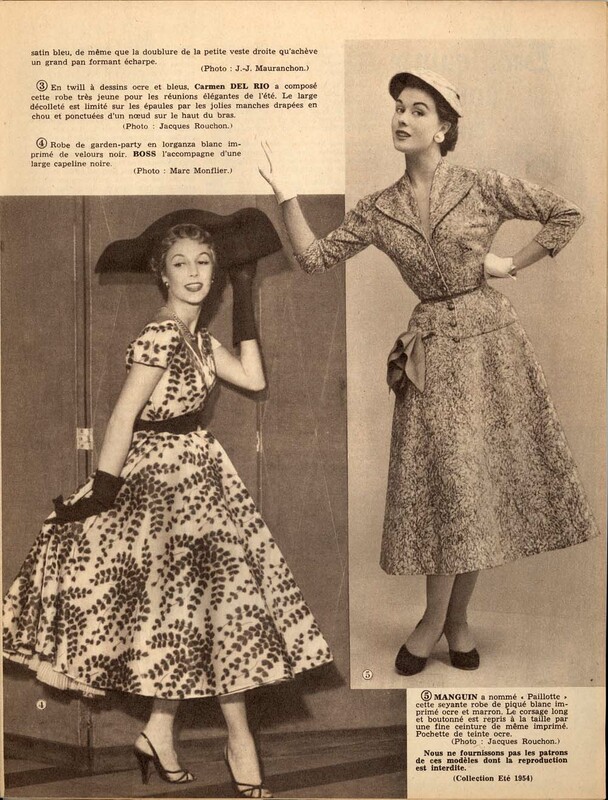 Of course, a dress like this would look best when worn over a fluffy petticoat but that would really be contrary to the idea of a simple little summer dress, wouldn't it? 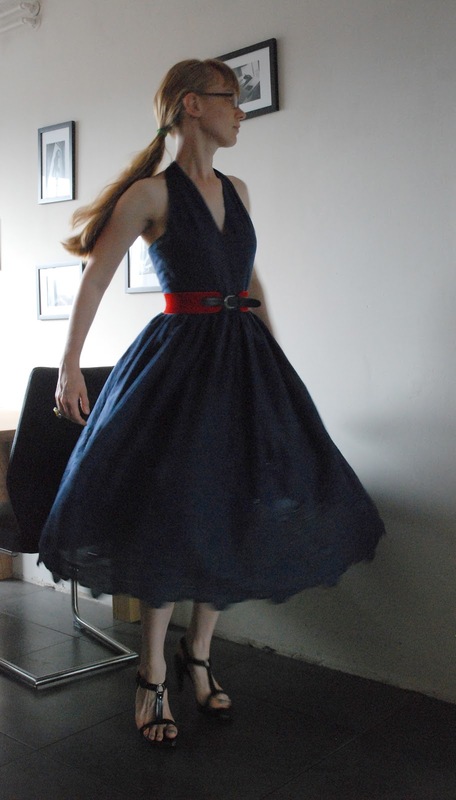 Anyway, it's great for twirling around. Just a quick update. Remember I told you I'd be busy this past week? 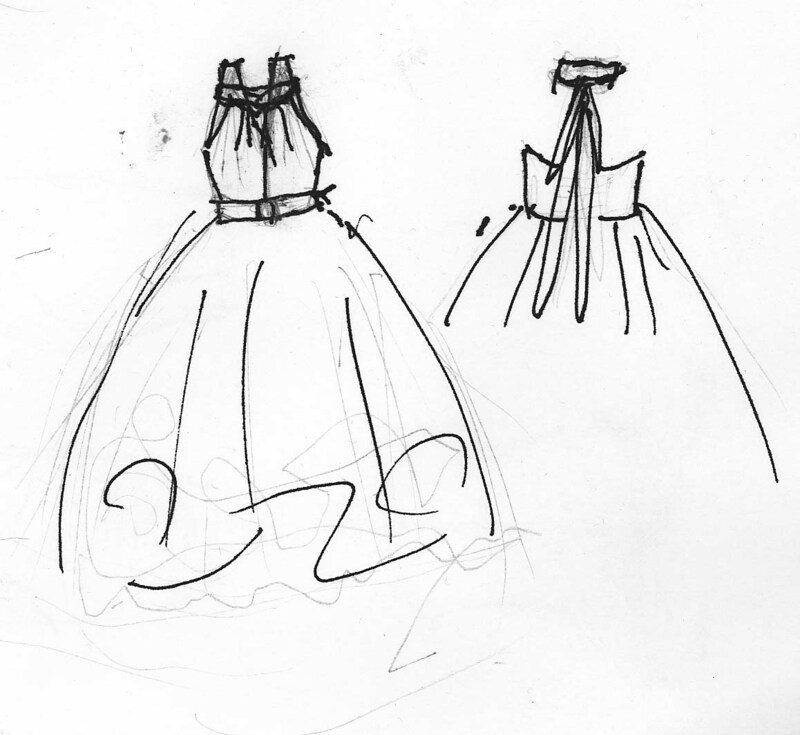 Well, I've been very busy helping designer friend M put the finishing touches on her collection for spring/summer 2013. 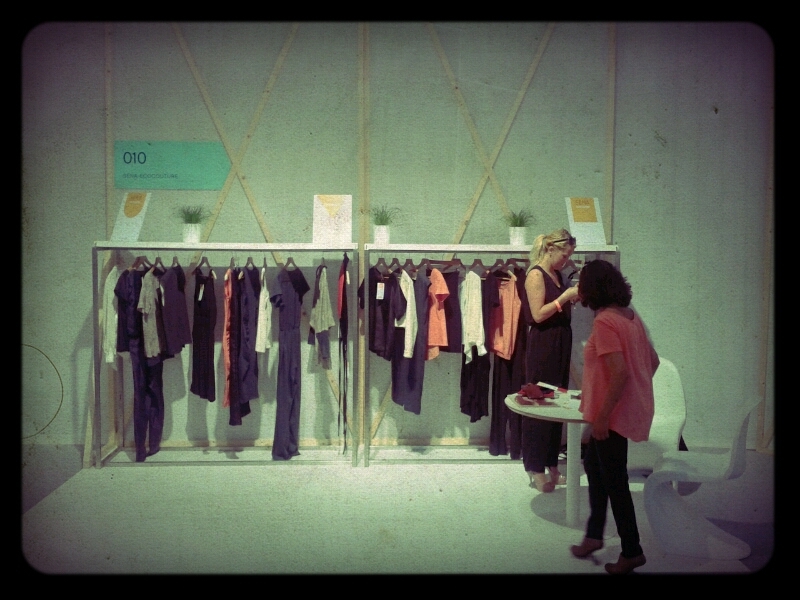 Now, we're presenting it at Holland's main fashion trade show Modefabriek. As a very small and 'fair' brand (eco fabrics, high labour standards, certified by Fairwear Foundation) we are in the MINT segment. Just pop by and say hi, you know what I look like. It all started with the 1970's Marions my aunt gave me but since then, I have focussed on an earlier time period. 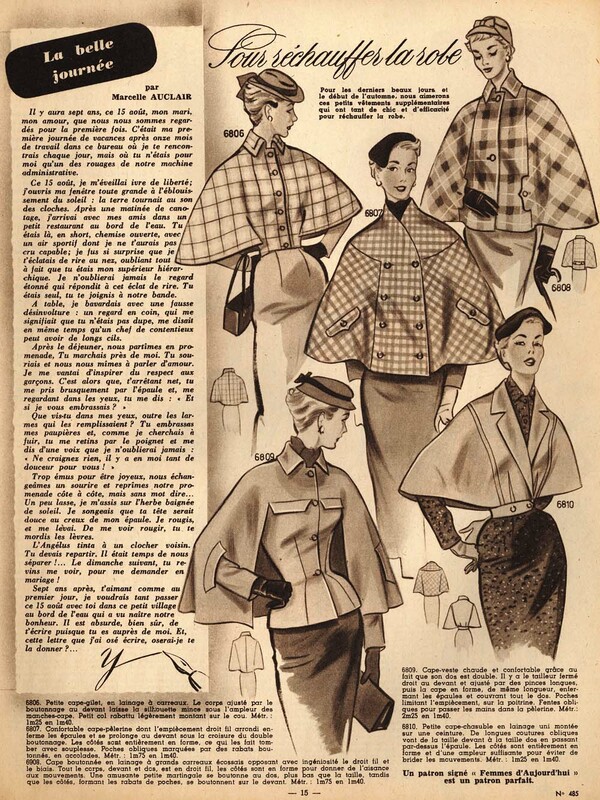 I think my oldest pattern magazine dates from 1912 (a sort of newspaper supplement, 4 pages and a rather rudimentary pattern) but I tend to concentrate on the 1950's. For some reason, pattern magazines (in Dutch, French and German and very occasionally in English) are much more frequently sold on Dutch auction sites then seperate patterns in envelopes. 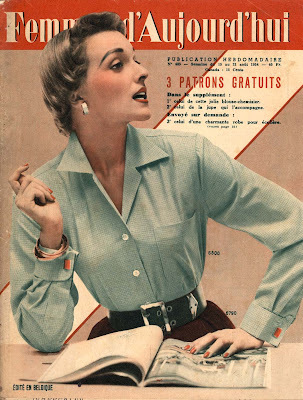 Magazines with lots of great pictures and the patterns to some of them. Because I tend to use any vintage fashion stuff I buy for inspiration rather than as 'direct sources' for my creations, I don't mind. 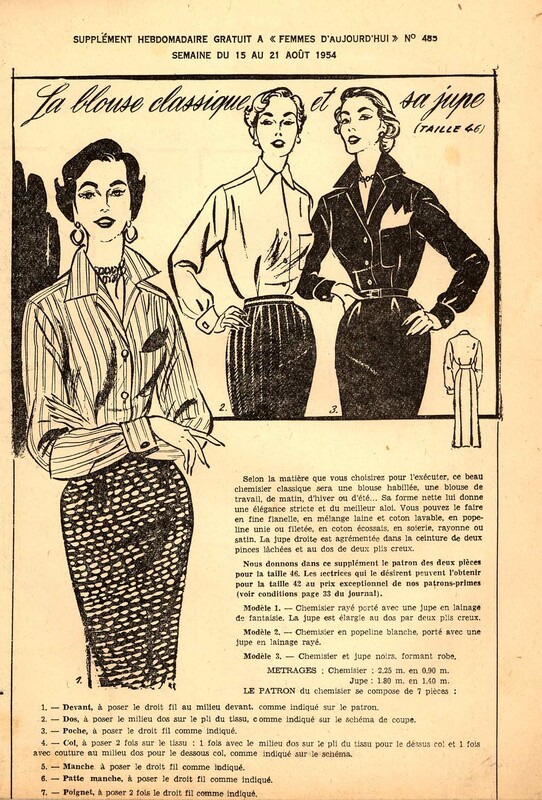 Today, I want to show you the mid-August 1954 issue of "Femme d'Aujourd'hui", a lady's magazine with a serious focus on fashion and sewing patterns, in French but edited in Belgium. This is the cover. It came with three free patterns, two on a supplement and one to order free of charge. 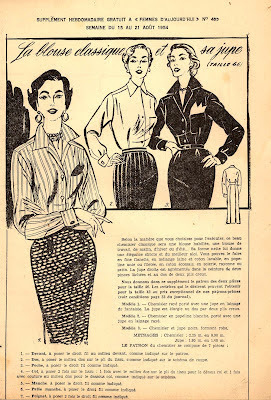 This is the pattern included in this magazine: a classic button-down shirt and a straight skirt with two pleats at the back. In size 46. Of course, there is fashion news. 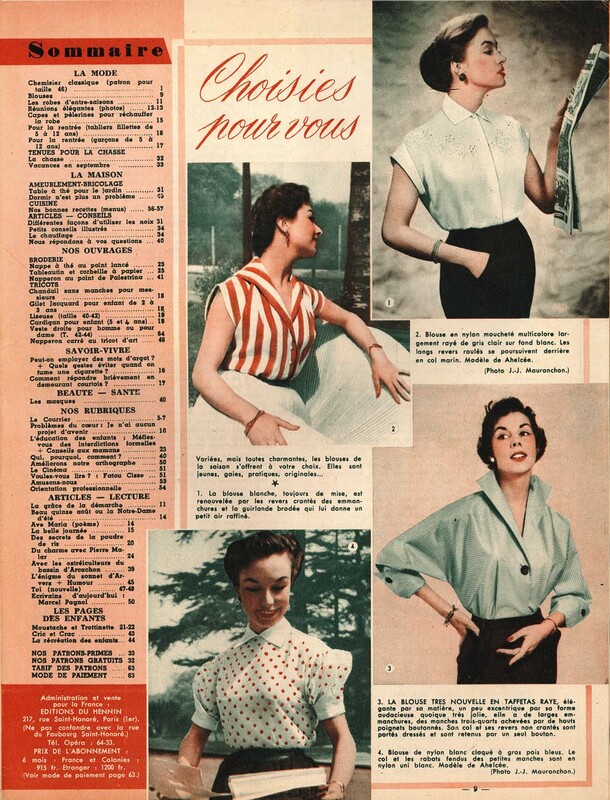 Here are some examples of the lovely new blouses for sale in the late summer of 1954. And a peek at designer fashion. 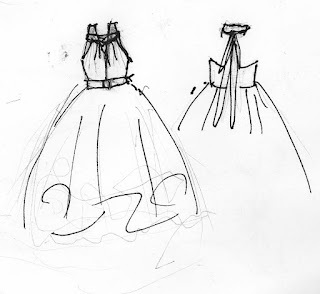 The dress on the left is by Boss, the one on the right by Manguin. And of course, there are plenty of very nice designs which the reader could order. How about these lovely sleek dresses? I just love all the inventive collar treatments. 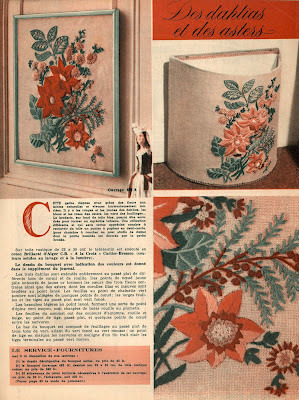 And of course there are children's patterns, and knitting ones, and assorted needlework. "Sleeping is not a problem". 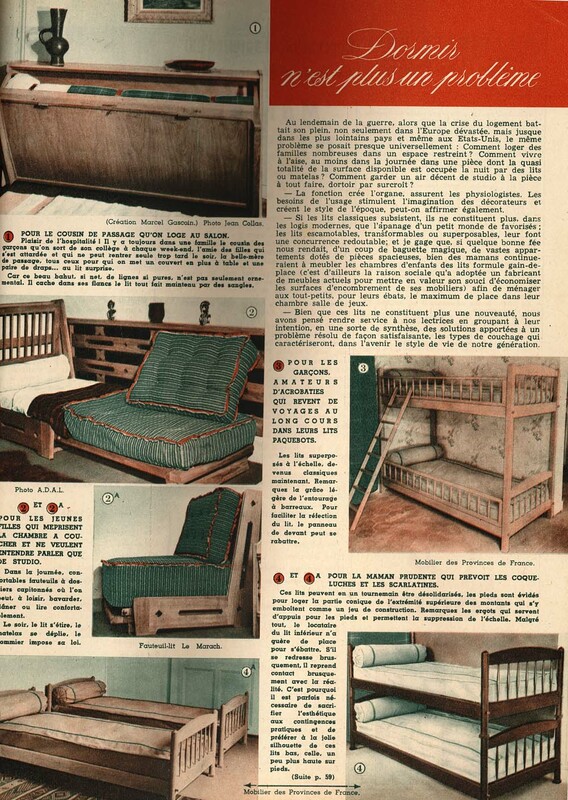 I guess living conditions in 1950's Belgium, like those in the 1950's Netherlands could still be a bit cramped even 9 years after World War II, so variaties of fold-out and bunk beds could come in handy. 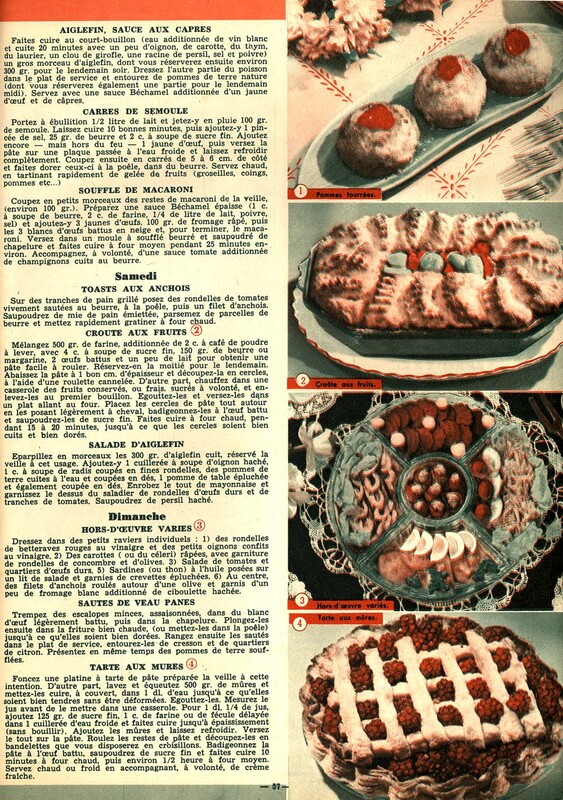 And of course, there are recipes. I think the half-colour print, used here, makes the dishes look particularly unappealing. Or maybe I'm just spoiled. Hi everyone! Just a few quick, random remarks this time. 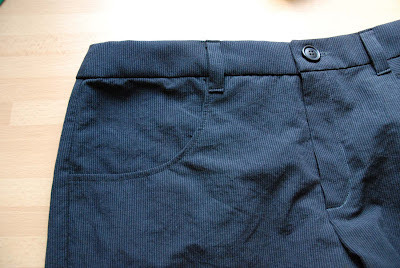 - Did anyone blog about and link to my first post about culottes? I'm just asking because, in the past week, I've received no less than four new comments on a post I did back in winter. They were all very nice and I hope those people have seen there is a tutorial in a later post. Just for the record, of course you can link to my blog posts and tutorials, I love getting new visitors! 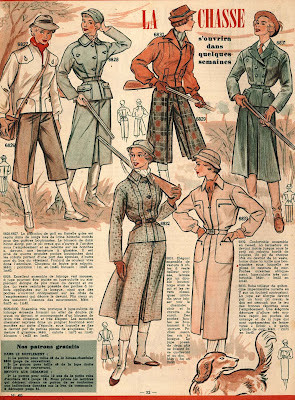 I'm just curious what sparked the renewed interest in the culottes. - I was going to complain about some Anonymous spam comments I've received (things which are written sort of like real comments, just without making reference to the actual content of my blog. and they all include a link), but after I deleted the first one, blogger spam filters seem to have kicked in so they no longer appear on to site (I just get them through the email). Even before I found out about the spam filter, I was going to write that although I don't like getting spam, I'm not going to make anonymous commenting impossible because I have also received very nice comments from real people, who just don't happen to have an online alter ego which blogger can recognize. I don't want them to feel unwelcome. - About the twisty top... Yes, I will make a pattern. Just, please, be patient. I will be very busy with work for the coming 2 - 3 weeks. I'll try to keep up regular posting but there won't be time for any big projects. After that, I will get to work on it and make a multi-size pattern with instructions. It's not so bad after all, is it? These things add about two cups sizes and I don't plan on wearing them. This is what it looks like without. And without trying to pose. I made the dress a size smaller than I should according to the measurement chart (Anna Mae made this dress a while ago and posted about it on Burdastyle. She went down two sizes. 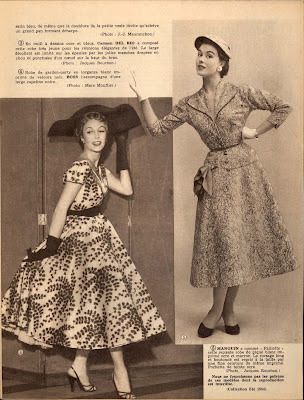 I should have done the same but the 'finished garment measurements' on the pattern tissue suggested that would leave me with no ease at all at the waist. Judging from the end result, that wasn't quite right). I shortened the waist length by the tiny amount needed for me. I made it in an appropriate fabric (one which behaves appropriately, I'm not talking about the look of it right now). Of course, I know I'm small-busted but the measurement chart actually gave be reason to believe that my chest and wiast measurement were in proportion. I cut the hips a size larger to compensate for their disproportionate circumference. Oh, and I left out the shoulder pads. 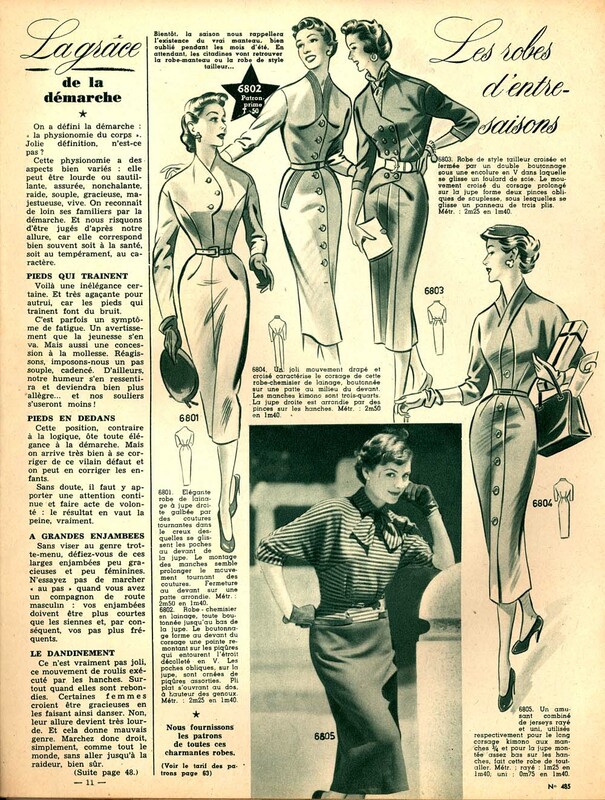 I'm not a big fan of shoulder pads and, in my experience, my shoulders are on the wide and square side in relation to my bust circumference (in Burda's sizing, I'm a 36 at the bust but the shoulders of a 38 usually fit me better). As a result, designs which are meant to be worn with small shoulder pads usually work best without. In case you were wondering, this is what the dress looks like with shoulder pads. And with shoulder and bust pads. And with just the bust pads. Of course, I could try to take it in, but with a design like this, that would take a lot of time (re-doing the side zipper and the hems on the cut-on cap sleeves...). And because of those gathers, the side seams would start mis-matching pretty soon. I could also try some sort of small bust adjustment but, also because of the idiosyncracies of the design, that would be quite a challenge. And I don't think it's a challenge I'm willing to take on. Don't get me wrong, V2787 is a great design. It's wonderful Vogue made a genuine 1940's pattern available to all of us modern-day seamstresses and adjusted it to its current size range. It's not as difficult as it's 'advanced' rating suggests either. I had some trouble with the way they mark the connecting points for those gathers (all the small and large circles and squares which were place so far away from the edge of the pattern tissue it wasn't obvious those should be marked with notches) but that is also down to me not reading the instructions. It's just that I could draft something 40-ish with gathered bits, made to my size and proportion faster than I could adjust this pattern. And it has some, historically correct, design details which are just not that great on me. That high neckline for example. The chest-to-shoulder gathers help a bit but on the whole, wide cut-on cap sleeves combined with high neckline only work well on a figure with a well-defined bust. 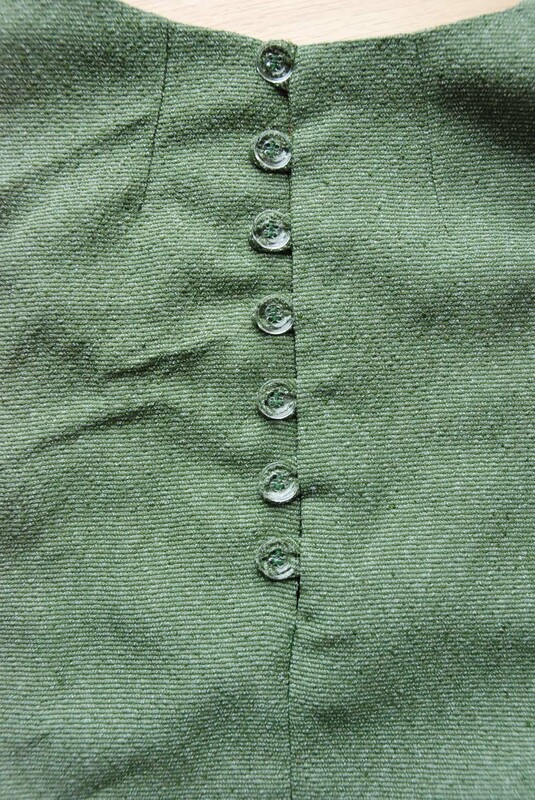 And this is one detail I like: I went with a side zipper but made loops and buttons at the back. I didn't crochet loops but made a very narrow tube of bias cut fabric which was a nightmare to turn. 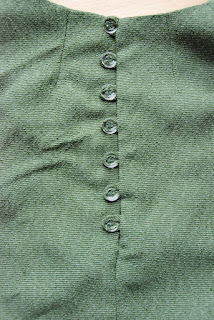 I didn't feel like wasting a cover-your-buttons kit on a dress I wasn't happy with, so I sewed on these transparant buttons instead. Which actually provides a rather nice look. Yes, pattern making is rather time-consuming. And it takes time and effort to get the practise that makes sort of perfect. Effort which needs to be repeated for any new element you try to master... To me, it's been well worth it but I always considered it very understandable that ladies with busy lives would prefer to just buy a pattern they like and get sewing. That's where I stand. Or, where I thought I stood. The truth is I don't usually look back to sewing from patterns. 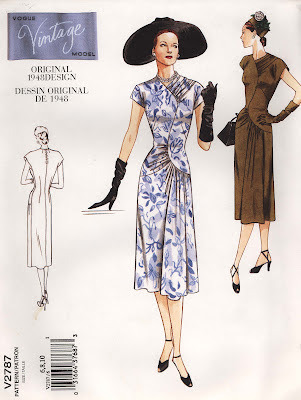 Yes, I made a dress from a Marion pattern, but that pattern was over 50 years old. Somehow, that makes a difference. Last week, I decided to do what I've announced before and sew a dress from one of the last patterns I bought a few years ago, when I was just starting to learn pattern making. 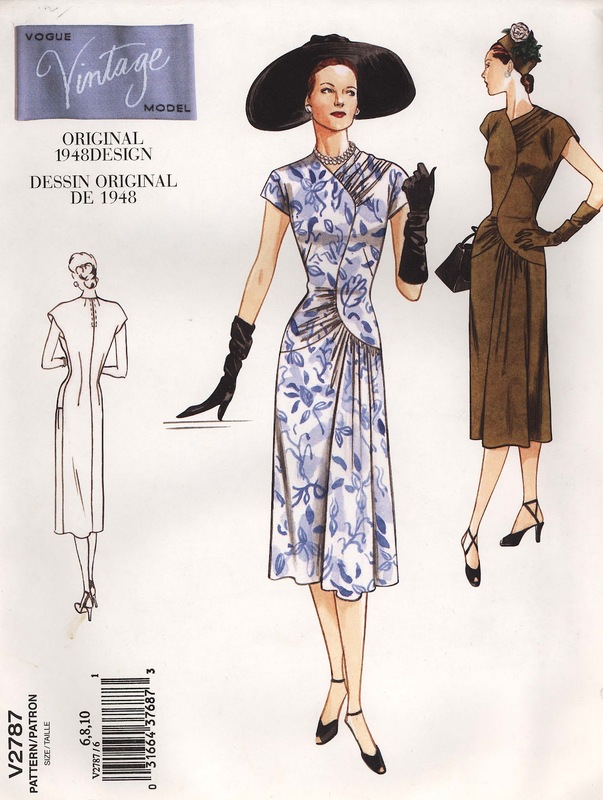 The pattern in question was this lovely Vogue reproduction (still for sale, I believe) and I was going to make it in the home-dyed crepe. I did make it. It's almost finished. I hope I will be able to take a picture tomorrow. When I do, I will do another blog post to tell you how I got on. For now, let's just say I really don't want to go back to using commercial patterns. Any time I spend fitting slopers and planning designs is won back by not having to second-guess the oddities of someone else's pattern and being assured of a decent fit.